Chairside Economical Restorations of Esthetic Ceramic (CEREC) is a state of the art technology that removes the lab, and the time, when creating tooth restorations for the patient. It is a more economic means of treating your dental problems and is much quicker than traditional restoring techniques. 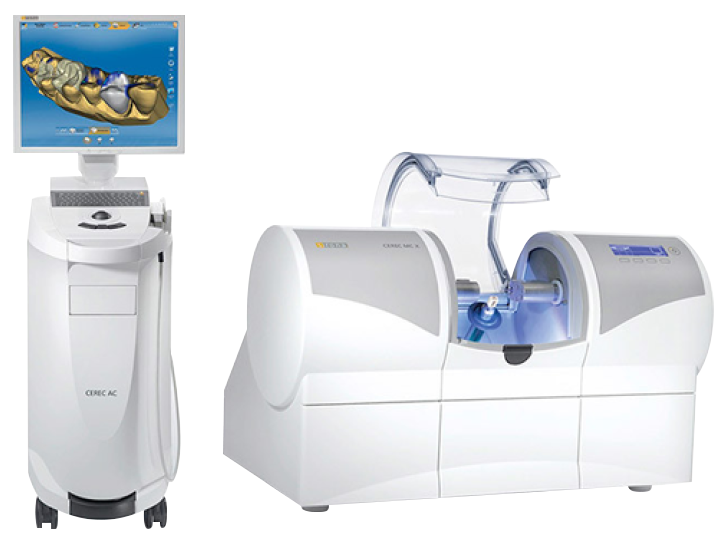 CEREC can be used for crowns, partial crowns, veneers and more! If you are in need of a crown, Dr. Travis will look at your tooth and determine if you are a candidate for a CEREC crown. After his initial examination he takes a 3D impression of your tooth with a special camera that will create the most accurate 'cast' of your tooth. Dr. Travis will then prep your tooth for your crown and take another virtual cast. A machine called the milling unit then creates your new restoration out of a strong ceramic material. Lastly, Dr. Travis puts a glaze on the new restoration, polishes it, and places in your mouth. It takes all of a two hour single visit! The advantages of CEREC technology is time and comfort. The virtual mold is much more accurate then a traditional mold and the crown is created in the office. No need for a temporary crown! CEREC technology gets you in and out with a new crown quickly and comfortably!